The TARDIS is lured to Earth in 1985 by a distress call sent by Lytton, who has made contact with a group of Cybermen based in London's sewers. 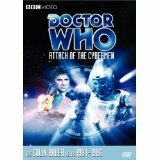 The Doctor and Peri are then captured and forced to take Lytton and the Cybermen in the TARDIS to the Cybermen's home planet Telos. 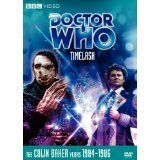 The Cybermen have stolen a time vessel from another race and plan to change history by crashing Halley's Comet into Earth and obliterating it before it can bring about the demise of their original home world, Mondas, in 1986. Another adventure for everyone's favourite Time Lord. The TARDIS is low on Zyton 7, and the only planet with the ore available is Varos. 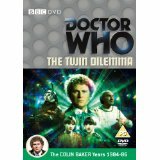 Upon landing, the Doctor (Colin Baker) and Peri discover a society addicted to real life TV violence, ruled by a corrupt regime. They have to help the rebel Jondar and thwart the Thoros Betan delegate, Sil, in his attempts to obtain the Zyton for his own conglomerate. The Two Doctors - The Doctor (Patrick Troughton) and Jamie arrive at space station J7 to ask the Doctor's old friend Dastari to cease his experiments in time travel. 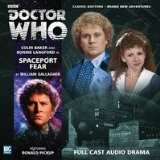 The station is invaded, and when Doctor number 6 (Colin Baker) and Peri arrive, they find a shell-shocked Jamie claiming that the Doctor has been killed. 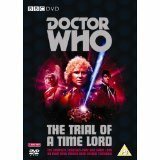 It is in fact all part of a Sontaran plot to discover the secrets of time travel, which necessitates a trip to Seville to rescue the earlier incarnation of the Time Lord. Patrick Troughton's last appearance as the Doctor. 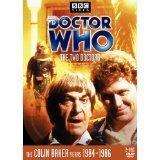 Double episode Doctor Who adventure set on the planet Karfel and in nineteenth century Scotland. 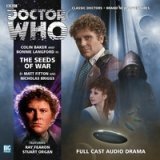 The Sixth Doctor (Colin Baker) and Peri, accompanied by a young man named Herbert, become entangled with the machinations of the despotic Borad. Planet Karfel consists of a small population ruled by a despotic, Wizard of Oz-like autocrat called The Borad. The Borad has never been seen in the flesh - only by means of closed-circuit television monitors wherein he appears a somber, upright old man. His rule of fear is enforced rigidly by an army of androids who destroy all dissent in a blink via the Timelash - an instant and irreversible exile to another, presumably horrific dimension. One member of the grand counsel immediately below The Borad, (called the Maylin) is less than happy with The Borad and seeks 'regime change' at any cost. A race of former allies called The Bandril sees weakness and opportunity in The Borad's semi-visible ruling methods and is set to invade. It is into this volatile situation that the Tardis materializes and our favourite time travelers are cast. 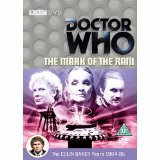 The Doctor and Peri arrive on Necros to attend the funeral of an old friend of who has recently died. However, Tranquil Repose is not all it seems and an attempt is made on the Doctor's life. 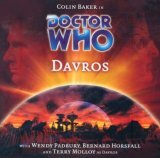 Soon the Doctor comes face to face with the Great Healer, only to discover it is none other than Davros, the creator of the Daleks, intent on rebuilding the Dalek race decimated by the Movellans.